Russia’s fledgling Sukhoi T-50 fighter, also known as the PAK-FA, continues to waddle through development even though the demand for the aircraft may turn out to be less than stellar. 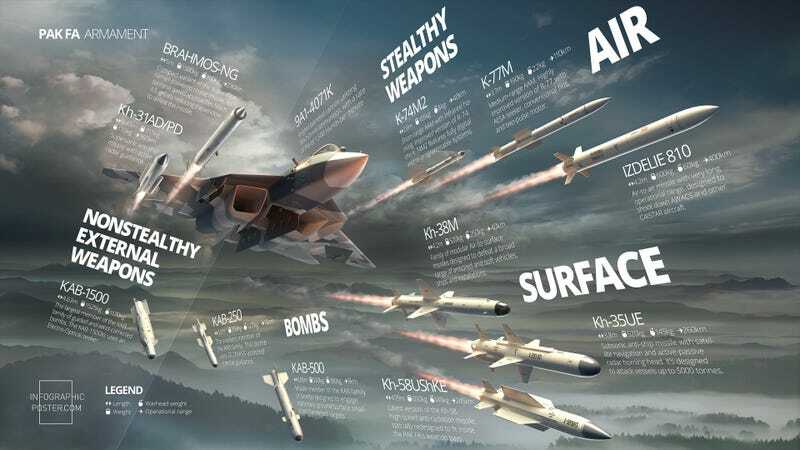 Nonetheless, Sukhoi hopes to integrate a wide array of weapons onto their new jet, including everything from supersonic cruise missiles to the latest available medium range air-to-air missiles. This is all shown in a visually explosive chart that was released by Russia’s United Aircraft Corporation in a recent tweet. Regardless of the T-50’s future prospects of being fielded in large numbers, you can see that many of the weapons on the chart above are beyond those needed for the basic air-to-air or air-to-ground mission sets. By looking at this menu of destruction, standoff attack is clearly a main tactic envisioned for the stealthy jet. According to the graphic, the T-50/PAK-FA will carry long-range missiles that are built to destroy the enemy’s airborne early warning and control (AEW&C) aircraft and key surface assets capable of similar duties at great range. This includes the Izdelie 810, the Kh-58USHke, Kh-35UE and the Brahmos-NG among others. The first three of which are designed to fit inside the aircraft’s weapons bays. The fact that the PAK-FA can haul these missiles internally, keeping its radar cross-section at a minimum, is key as even its more moderate approach to low observability, at least compared with American and even emerging Chinese fighters, when combined with its supercruise ability (cruise beyond mach 1 without the use of gas-guzzling afterburners), is aimed at allowing it to get within launching distance of these key command and control and sensor assets without being successfully engaged. If anything else, this capability will make enemy fighter aircraft tasked with protecting high value, low density assets have to adapt their tactics to counter those of the T-50s, such as extending out farther from the dependents they are trying to protect. Such a move can result in other other tactical vulnerabilities and strategic deficits that can be exploited as a result. The U.S., by comparison, relies on the AIM-120 AMRAAM for its longest reaching air-to-air weapon, with even the new AIM-120D sporting a range that is said to be well less than the detection ranges that modern active electronically scanned array (AESA) radars, like those on the F-15C, F-22 and F-35, can provide. Additionally, the networked battlespace can potentially offer targeting via third party sensors (AEW&C assets, AEGIS destroyers and cruisers) over many hundreds or miles in addition to that of even the best AESA radars used in U.S. fighter aircraft. These targets cannot be engaged as there is no missile in the U.S. inventory that can do so. Additionally, there is no anti-radiation or long-range anti-ship missile in the U.S. inventory that can fit within either the F-35 or the F-22’s weapons bays. As such, these advanced fighters have to do their bidding at closer distances to their targets than their Russian counterpart based on available weapons alone, or they would have to fight without their stealth advantage, slinging long-range weapons under their wings. This all adds up to an interesting intersection in air combat theory. On one hand, America’s more stealthy fighters should be able to carry their shorter-ranged air-to-air munitions closer to enemy targets than their competitors. At the same time, the best of both worlds is packing long-range standoff weaponry inside a very stealthy aircraft, as distance and the aircraft’s degree of low-observable treatment from certain angles equals its detectability range by a given enemy radar system. Extra weapons range therefore buys extra stealth, or in other words, it keeps the launch aircraft outside of the detection range of enemy sensors at closer ranges. This may not be a big issue for the U.S. today as America’s stealth technology and weaponry combo is adequate even against advanced enemy air defense systems, but as stealth shaping and materials become less effective due to developments in radar systems, processing power networking, being able to carry longer-range weapons internally would buy an weapon system time as far as its relevancy and effectiveness on the battlefield goes. The weapons range issue is more important for Russia than the U.S. and NATO because the west relies heavily on AEW&C assets for air combat supremacy, and even if the PAK-FA can be detected, it may not be able to be engaged within the distance that it can launch its long-range weaponry. Thus a supercruising PAK-FA showing up on radar briefly at great range may give an AEW&C aircraft crew awareness of its existence, but it will not kill the long-range missile that was launched from the PAK-FA during that moment in time. As such, the PAK-FA’s low observability, although far cruder than American stealth designs, will buy the jet extra undetectability at long-range so that they can get a long-range missiles successfully on their way towards key aircraft, surface targets and surface-to-air missile sites. In the end, even the most advanced fighter in the world is still enabled or handicapped by its available weaponry. The designers of the PAK-FA/T-50 are clearly aware of their own limitations and are using weaponry to exploit the aircraft’s strengths and de-emphasize its inherent weaknesses. A relevant, albeit far from ideal strategy when your aircraft is clearly at a low obseravability disadvantage. Still, this does not take into key factors like how reliable these weapons are or will be, when they will they be operational and how accurate the claims made about them by Russian manufacturers are. Not to mention their susceptibility to jamming and countermeasures.